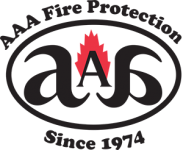 For complete fire protection services, Richmond and East Bay Area businesses turn to AAA Fire Protection Services. We offer a complete list of fire protection services, including fire sprinkler services. We've been serving Richmond businesses for the last 40 years. Our long service record includes integrity and honesty and we are proud of the long and positive relationships that we've built with the Richmond area businesses. At AAA Fire Protection Services, we take the risk of fire seriously. That is why we've constructed a team of industry professionals to help businesses like yours reduced the risk of fire and the damage that fire causes. Our comprehensive list of fire sprinkler services includes fire sprinkler installation for new building projects and buildings under renovation. In addition, we offer fire sprinklers inspections and if needed fire sprinkler repairs. We set up and monitor fire equipment so that your business is always in compliance with local, state and federal regulations. As we do our job, we gather data and we provide documentation that satisfies the needs of governmental agencies like Cal-OSHA. For more information about our services or to talk with our design team about new building projects or renovations just give us a call at (800) 543-5556.